Westmoreland County is teeming with things to do. The Westmoreland Museum of American Art, located in Greensburg, opened in 1959 and hosts one of the area’s biggest collections and exhibitions of American and southwestern Pennsylvania art. 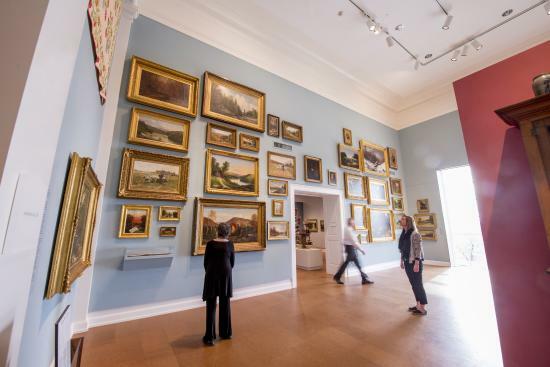 The Westmoreland, as it is referred to, hosts a number of rotating exhibits throughout the year that include sculptures and paintings from 18th, 19th and 20th century American artists. Visitors are able to enjoy guided or self-guided tours, afternoon and evening lectures, family visits, classes and camps for children, and unique items from the museum gift shop. Historic Hanna’s Town and Fort Ligonier are two of the county’s most famous historical sites and museums. Both of these sites offer a glimpse into the region’s history through tours, exhibits, and living history events and activities. ​At the heart of Westmoreland County’s growing cultural district is The Palace Theatre in Greensburg, Westmoreland County’s hot spot for live shows and entertainment. The Palace Theatre, opened in 1926 as the Manos Theatre, offers a year round schedule of shows, concerts, comedy acts, musicals, and plays for people of all ages. The theatre is home to the Westmoreland Symphony Orchestra, is a regular venue for the River City Brass Band, and welcomes numerous celebrity acts each year through Latshaw Productions and The Westmoreland Cultural Trust, current owners of the theater. Small community theater and art groups, as well as local high schools, use the theatre to host a variety of productions throughout the year. Perhaps most noteably, The highly acclaimed Pittsburgh Ballet Theatre, which tours both nationally and internationally, also makes regular stops in Westmoreland County at the Palace Theatre to put on first rate performances in conjunction with the Westmoreland Symphony. The Geyer Performing Arts Center in Scottdale has enjoyed over 100 years as one of Westmoreland County’s premier cultural centers. The building has a rich and colorful history and continues to hold a long-standing tradition as a community gathering place. Originally known as the Geyer Opera House, The Geyer Performing Arts Center was the cultural vision of Andrew Geyer, who was the son of a local hotel proprietor. Mr. Geyer built the theater in 1900 and was very successful in establishing the Opera House as a popular social venue which had the honor of hosting many notable theatrical and musical performers. ​In addition to welcoming famous actors and musicians to the stage, Westmoreland County is also proud to support amateur adult and children actors from local theater groups such as the Greensburg Civic Theatre, Alabaster Productions, the Apple Hill Playhouse and StageRight!. These companies host a variety of amateur theatre events to the community and offer acting classes for children and adults. Rounding out the Westmoreland County performing arts scene, you will find a host of live performances on display through the performing arts programs at Seton Hill University, Saint Vincent College, and the University of Pittsburgh at Greensburg.